Yield Management allows you to define global settings for specific rate codes and package restrictions for specific packages. "Package restrictions" lets you set dates a that package is allowed, and days of the week a package is available. Go to Manager/Setup > Hotel Control Files Setup > Yield Management. 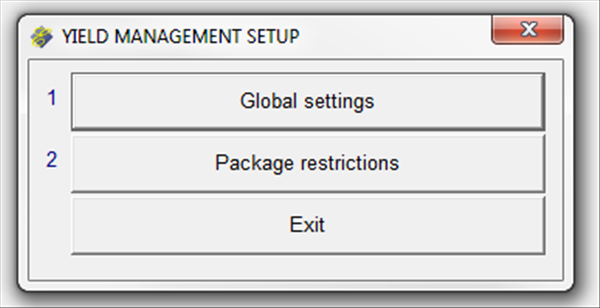 Select "Global settings" or "Package restrictions". At the prompt enter the year in YYYY format (2014). The Global settings table will display. "Begin date month day" is the beginning date that specified rate codes are NOT available. 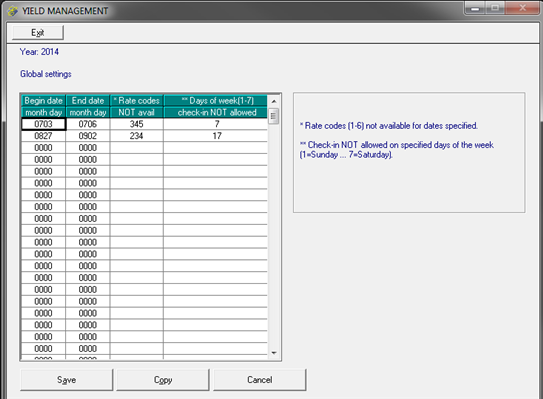 "End date month day" is the ending date that specified rate codes are NOT available. "Days of week (1-7) check-in NOT allowed " designates the days of the week that check-in NOT allowed within the defined date range. 1=Sunday; 2=Monday; 3=Tuesday; 4=Wednesday; 5=Thursday; 6=Friday; 7=Saturday. Enter the numbers without punctuation or spaces. 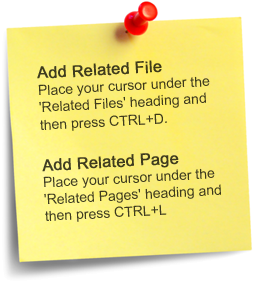 Click "Save" or press Alt+A to save and exit. Click "Copy" or press Alt+O to copy this record to another year. Click "Cancel" or press to exit without saving. - At the prompt enter the package code or select Lookup. Then enter the year in YYYY format (2014). "Begin date month day" is the beginning date this package is available. Use MMDD format such as 0201. "End date month day" is the last date this package is available. Use MMDD format such as 1215. 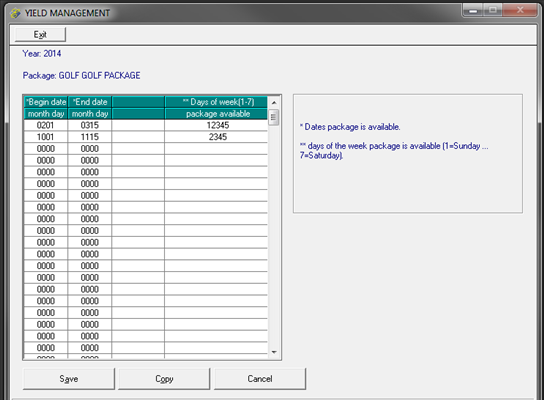 "Days of week (1-7) package available" designates the days of the week that this package is available. 1=Sunday; 2=Monday; 3=Tuesday; 4=Wednesday; 5=Thursday; 6=Friday; 7=Saturday. Enter the numbers without punctuation or spaces (example: 234). If the package is available all seven days, you can leave this field blank. Click "Save" or press Alt+A to save and exit. Click "Copy" or press Alt+O to copy this record to another year. Click "Cancel" or press Esc to exit without saving.